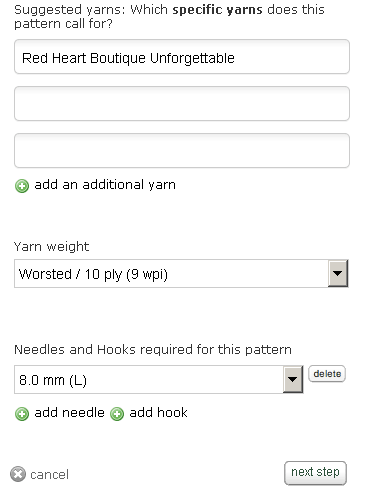 I was asked for some assistance from a friend on how to add a pattern to Ravelry. 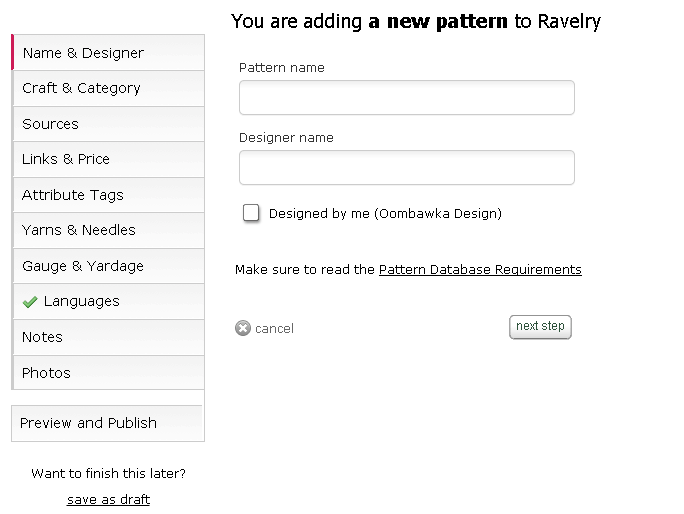 There is an excellent tutorial available on Ravelry that outlines how to add your first pattern to the Ravelry Store, the costs involved in doing so and how to manage your store in ravelry pro. Ravelry comes with unlimited hosting space. 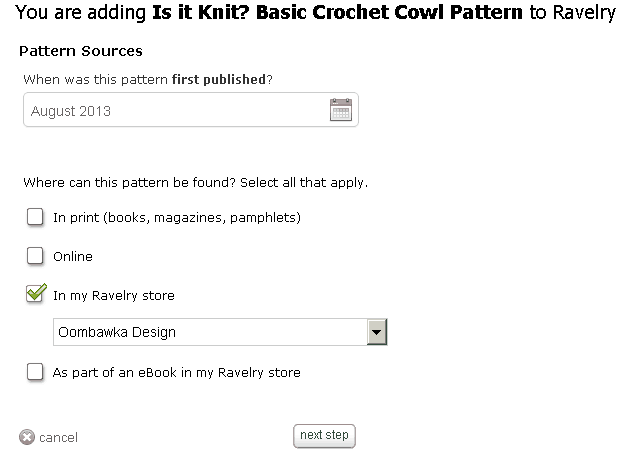 For pattern sales of under $30.00 USD/month there are no extra fees from Ravelry for hosting. After you reach $30.01 USD/month you enter into paid tiers – where a percentage of your total sales is payable to Ravelry. 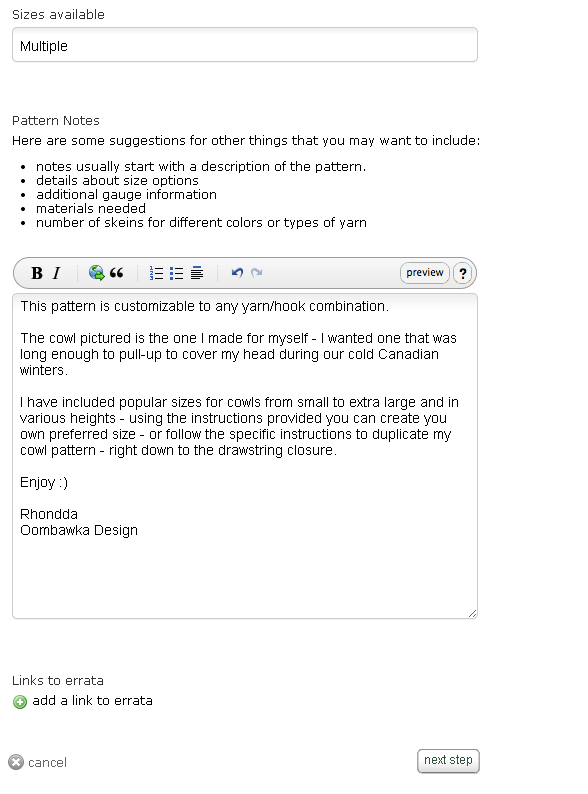 The purpose of my tutorial is to assist with adding your first pattern to the database. 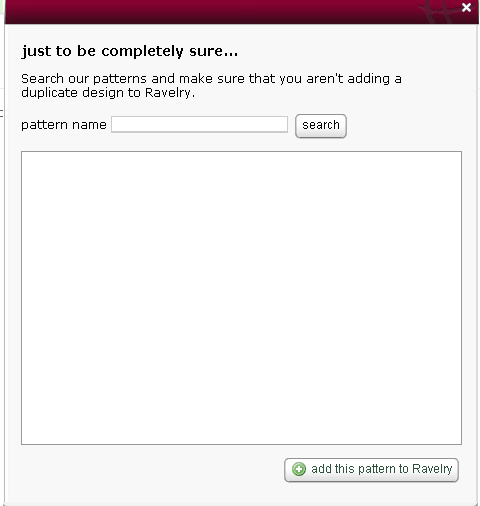 After this pattern is associated with your Ravelry ID you will be able to open your Ravelry ‘store’ in pro. Select my notebook (top left options menu). 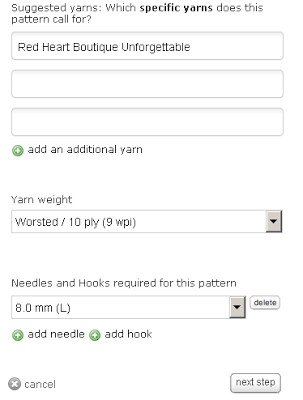 Select the option you want beside Add a pattern to Ravelry and select the do it button to the right of the option box. 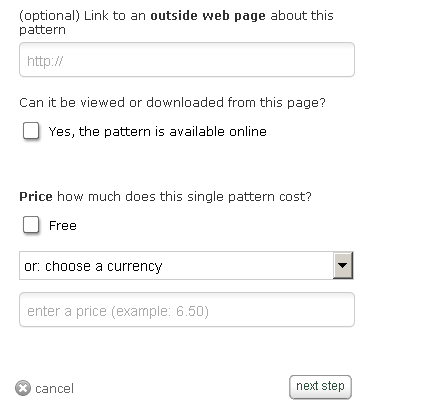 The other available option is “A pattern that someone else designed (free or for sale)”. This is actually a very good double check system – because you really don’t want to add a pattern with the same name someone else has already used on the system. You want your pattern to have a unique name – but a name that tells people what it is. 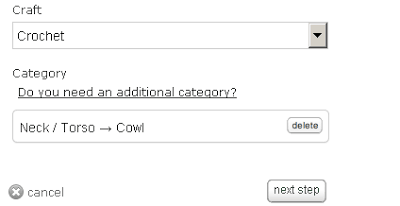 So be sure to use keywords in your pattern name…my pattern is for a cowl…so I am going to choose a pattern name that includes cowl. It makes it easier for other people to find in their searches. Enter the required information – since I already have a pro account with Ravelry my little Designed by me (Oombawka Design) option box is available to ‘click’. At any point in this process you can save as draft (bottom left-hand corner). Select the Craft and Category. Categories available are clothing, accessories, home, toys and hobbies, pet and components. Within each of the categories are subcategories. Next we need to enter an approximate publishing date for the pattern and the location the pattern can be found – so if you are offering this in the Ravelry store you would select In my Ravelry store. If it is available on your Blog – select Online. 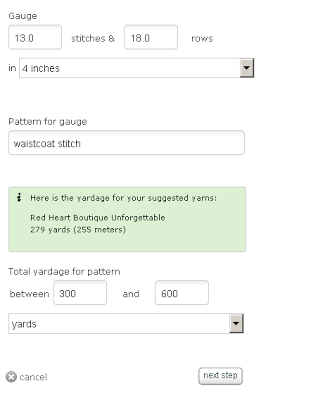 Now you can enter the web page address (URL) where your pattern can be found – if it is available on your blog or at an alternate pattern store (like Craftsy, or Etsy). You need to enter the http:// at the beginning of the URL. Can your pattern be viewed or downloaded at the provided URL? If yes select the box. How much are you going to charge for your pattern? If you want to enter a price you need to select the currency first before the price box option becomes available. 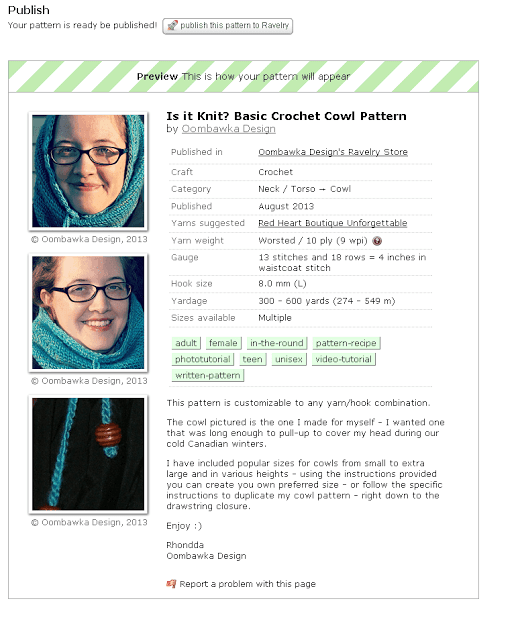 My cowl pattern is Free so I select the check-box beside Free. Now we move onto the nitty gritty of the pattern…I find it helpful to have my pattern accessible to help with the next few pages of questions. 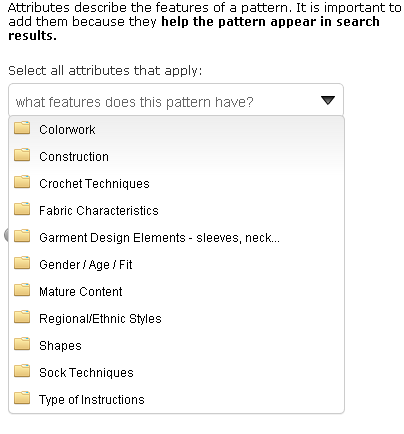 The first page we come to asks for Pattern Attributes – this is very important – it will help the people who search for patterns – find your pattern. You can select as many, or as few options as you want – just remember these will either help, or hinder people from finding your pattern! Enter the yarn(s) you used to create the pattern and the hook(s) you used to obtain gauge for the pattern. As you type the system will begin filtering through its database to find similar results; once you see the yarn you want you can select it. Once it has been selected the yarn weight information is prepopulated with the assigned yarn weight from the manufacturer. 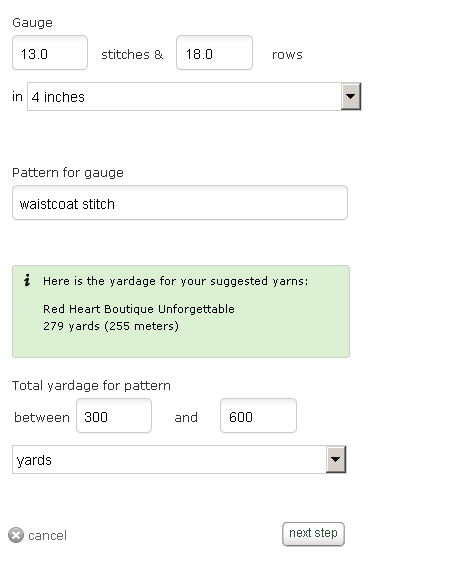 Enter the gauge information and an estimate of the total amount of yarn used to create the pattern. The next page is language selection. You can choose from 21 different languages – including Universal – no written language if you have a charted pattern. 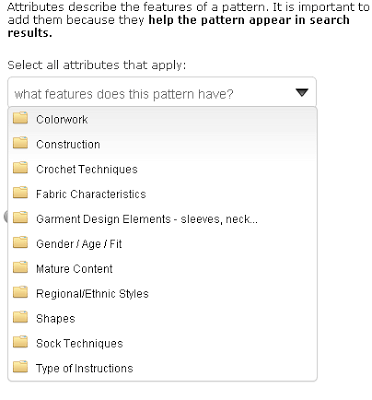 Now you have reached the main page of your pattern – you need to enter the Pattern Notes – this is your description – why do people want to use your pattern? What is special about it – if you have extra information about gauge or the actual wraps per inch (WPI) of the yarn, extra materials required (like safety eyes for amigurumi) or felt, etc. -you can add all of this extra information in your Pattern Notes box. Select your photos next – you can upload them from your computer (I still do this – but need to start utilizing my Flickr account! ), or you can use an online system like Flickr or photobucket. Make sure you enter the copyright information for the photos. Once the photos show up you can move them around (their order) and reposition your photos within the little boxes. The first photo on the left is the one that will show with your pattern in the main searches so make sure it is a good one! When people are visually scrolling through patterns – you want one that will grab their attention. 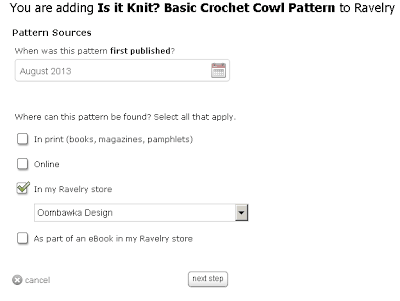 Now we have reached the Publish screen – remember if you aren’t quite ready to click Publish you can still save your draft copy to work on later 🙂 Once you click Publish, your pattern hits the newly added patterns section on the main page for Ravelry. 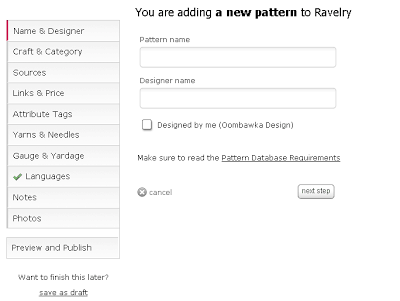 Now you have added your first pattern to the Ravelry Database you can follow this great tutorial on how to add your pattern to your new Ravelry Store. I hope this helps someone – sometimes it helps to see what you need before you sit down to enter the information for the first time! If you have any questions please let me know and if I don’t know the answers I will try to find them and add the information to the post. I am a designer. I have a Ravelry profile. I tried to add a pattern that I designed. This tutorial is wonderful if you know what you’re doing. 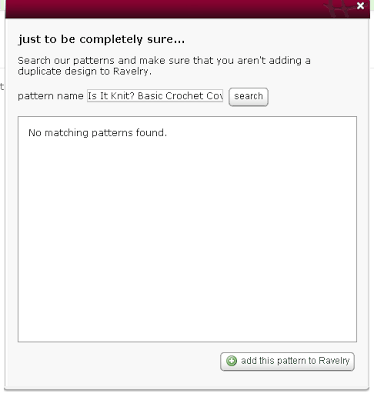 It and Ravelry assume you already have a “Store”. I do not and nobody at Ravelry seems to want to assist me.